Turn oven onto broil. Place Panko, cheese, and onions in small bowl and mix well. Pour onto a rimmed plate. Add eggs to a bowl and beat them. Dip each fillet in eggs. Then place 1-2 fillets at a time on dry mix and pat down lightly to allow the crust to stick to the fillet. Flip fish to crust the other side. Place fish fillets on a baking sheet and season each fillet with pepper. Broil fish for about 4-5 min (until cooked). Take fish out of oven. Flip each fillet and pepper the uncooked side. Return fish to the oven to broil the uncooked side for 3-4 min (until cooked). *Optional: You can add a little margarine to the top of each fillet after you flip to broil the uncooked side. This will keep the fish from tasting dry. I served with a little pasta and a salad topped with my Ruby Vinaigrette. 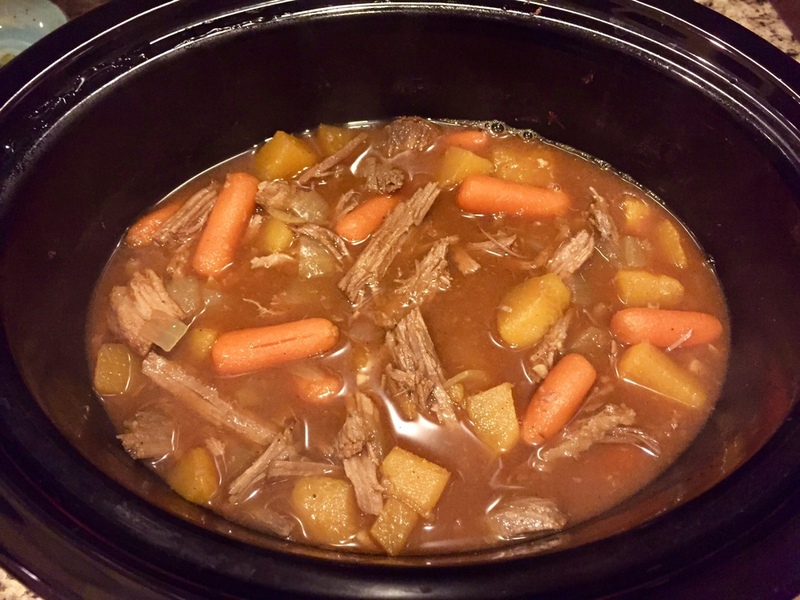 Add all ingredients to a slow cooker (Crock Pot) and stir together well. Cook on low for 6-8 hours. This a such a delicious, hearty stew. It's great for those of you who work full time jobs like me who still want to cook a good meal. I cut/prepared all of my ingredients the night before and kept them refrigerated. When I was just about to leave for work, I added everything to my slow cooker, and turned it on low. It was completely ready when I got home. Peel and cut potatoes into cubes. Boil potatoes about 10 min. They should be easy to poke with a fork when done. Drain the potatoes. Add all ingredients to a pot and mash with a potato masher. Mix well with a spoon. Serve with beef stew over the creamy mashed potatoes. Enjoy! Pour beer into pot and add garlic, hot sauce, cayenne, chipotle powder, and bay leaf. Stir ingredients together and bring to a boil. Place shrimp into a strainer big enough to sit into pot and not touch the boiling liquid. Season shrimp (with shells on) generously with Old Bay seasoning, stir while in strainer over a sink, and season shrimp again with Old Bay. Once liquid comes to a boil turn heat down slightly (still boiling but bubbles not touching shrimp), place shrimp in strainer on pot over liquid and cover with lid. It's okay if there is a slight space where the lid isn't keeping it closed completely. You just want most of the steam to get to the shrimp to cook them. Cook for about 5-6 min and stir shrimp and cover. Continue to cook for another 3-4 min stirring maybe once more if needed. You do not want to over steam the shrimp. Once all of the shrimp are fully cooked (no shrimp with any gray/raw spots), spoon out the shrimp to plate. This is one of my favorite meals, and it is incredibly easy to make. I usually serve with fries or salad and pasta. If I do not have that much time, I will use the Knorr bagged pasta (either creamy garlic shells or butter herb pasta). Melt margarine & olive oil together in large skillet on medium heat. Add onion, garlic, peppers, and celery cooking until tender. Add flour & seasonings, stirring for about 2 minutes. Stir in milk a little at a time; cooking until thickened. Add soup & cheese stirring until it is mixed well and cheese is melted. Add crawfish and cook a few more minutes allowing all ingredients to mix together well. Cook pasta as directed on box. Pour sauce over noodles and serve. I have also used frozen non-seasoned crawfish tails that I placed in a ziploc bag with seasoned water. I seasoned the water with Zatarain's crawfish/crab boil dry seasoning, cayenne pepper, hot sauce, and Tony's Chachere's. I let them soak for 6-12 hours in seasoned water in the fridge. Make sure shrimp is thawed. Add packet of BBQ Shrimp Seasoning in 1/2 cup of water and let it soak for 5 min. In a large saucepan that has a lid (you will need the lid later), add butter, margarine, olive oil, Worcestershire sauce, heavy cream, and bay leaves. Stir well and cook on low heat for 5 min. Add the water and seasoning mix to the pan. Continue to cook on low for 5 min. Add shrimp to the pan and mix well. Cover the pan and cook on low until shrimp are fully cooked stirring every 2 min. Start preparing grits once shrimp are almost done. Since I was only cooking for 2, I used instant grits packets. I placed dried grits in individual bowls. I added 1/2 cup whole milk to each bowl of grits. I cooked them on high in microwave 1 min. Stir grits and add a tiny bit of garlic salt and pepper to each bowl. Stir and add your desired amount of goat cheese to the grits. Place the bowls back in microwave 20 seconds. Stir well mixing in the goat cheese until smooth. Crack a little more pepper on top of grits. Top the grits with shrimp and sauce from the pan. Serve with toasted bread (because you are gonna want to sop every drop of this up...it's that good!). Enjoy! This will make 3 patties. Mix meat, ketchup, sauces, and seasoning in a bowl. Form into 3 patties. Cook patties in skillet stove top until well done on both sides. Top each patty with cheese and a spoonful of your favorite chow chow. Cover skillet and let the steam melt the cheese for about 1-2 minutes. Enjoy! I have not listed specific amounts of ingredients because I want you to get creative and use the amount YOU want. Fire up the grill and get it to about 500 degrees. Grease the grill grates using tongs with a paper towel soaked in your choice of olive/canola/veggie oil. Open dough can a spread out the dough into a large rectangle. Use all purpose flour to lightly sprinkle each side of dough and spread flour around on dough with your hands (to prevent dough from sticking to grill). Cut the dough into 4 smaller rectangles with pizza cutter. Place the dough on grill using a spatula and cook for about 2-3 min (until bottom is crispy but not burned). Using spatula, take dough off grill and flip over to apply toppings on the cooked side of dough. Toppings: Place 1 spoonful of Alfredo sauce on each piece of cooked dough and follow with a spoonful of BBQ sauce. Spread the sauce around using spoon to mix on the dough. Top each pizza with pulled pork, goat cheese, Parmesan cheese, and fresh rosemary. Place the pizzas back on the grill with the uncooked side down with the toppings on top. Cook for another 2-3 min or until the bottom of dough is crispy. Y'all...this pizza is to die for! The description seems lengthy and difficult, but it is so easy. In small mixing bowl, combine all dried spices (mix well). Pat the pork chops dry and rub each side generously with the dried spices. Grill each pork chop to your liking. I like mine well done with a little char around the edges. I grilled these at 400 degrees for about 10-12 min on each side. Plate your chops and top with the citrus reduction sauce. I paired mine with grilled okra (see recipe in side dishes section). Cook ground beef, onion, and green pepper with taco seasoning in a pan until well done. While that is cooking, add Rotel and cheeses to large bowl and mix well. Add meat to that same bowl and mix well. Add lettuce and chips last and mix well. Plate your dish. Top with your desired amount of sour cream and Catalina dressing. In a crock pot, add: cans of soup, water, chicken bouillon cube, seasonings, and stir. Then, add the vegetables and stir. Lay chicken breasts on top and season them with salt and pepper. Cook on high for 5-6 hours. After about the first 2-3 hours, push chicken down into the sauce. After a total of 5 hours, shred the chicken that is in the crock pot and stir. At the last hour, tear the biscuits in small dumpling like shapes and put them in the crock pot. (I really mash my biscuits flat as I tear them.) Stir lightly (almost folding) to stir in the "dumplings" without tearing them. Stir occasionally (every 10-15 min) this last hour. Add chicken broth during this time if needed. The dumplings will soak up some of the liquid possibly causing the sauce to become too thick. If you like your sauce more soupy, just add chicken broth until you achieve your desired consistency. The dumplings should cook well enough within 1 hour, if they still look too doughy, just cook a little longer until they aren't doughy. This is one of my favorite comfort meals to eat when the weather is cold. I hope you enjoy it!